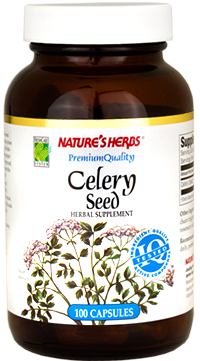 Nature’s Herbs Premium Quality Celery Seed is cultivated from the wet lowlands of India. Its Latin botanical name, Apium graveolens L., is purported to be taken from the prehistoric Indo-European word for water. If that’s true, it is entirely appropriate since Celery grows best in wet and salty soils, swamps and marshes. Indian specialists in the 17th century developed the familiar stalk celery we eat today from this wild plant. Take 3 capsules daily, preferably before meals. Do not use if pregnant or nursing. Consult a health care professional before use if you are taking any medication or have any medical condition. This product should no be used by people with kidney disorders. Do not use if you are allergic to celery. People with fair skin should not over expose themselves to strong sunlight while taking this product due to the photosensitizing nature of this plant. KEEP OUT OF REACH OF CHILDREN.